"Curriculum, Recycling, & Purchasing Drive a Transformation"
I was a classroom teacher for 30 years, and now serve as Director at Berkwood Hedge. The Berkwood Hedge community made a commitment to set an example of sustainability and environmental awareness through our curriculum, recycling programs and purchasing decisions. It has been a great learning experience for students and adults throughout the school community. We have reduced our landfill trash by half! Students understand the impact of waste, and participate in a "no-waste lunch" program. We have institutionalized no-waste events, where everything is either reusable or compostable. In 2005, as a result of our ongoing efforts, we became the first school in Alameda County to earn certification as a Green Business! We've been in this together from the start. Administrators, parents, teachers and students have all taken on leadership roles. - Worm composting is part of our science program. - We did a lunch audit and instituted no-waste lunches. 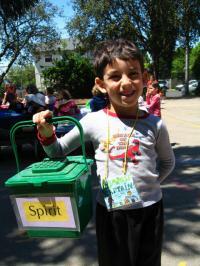 - Students are stewards of different areas, and are responsible for emptying compost bins, recycling paper, etc. We got an early start, and we keep at it. We have been recycling paper, cans and bottles for over 30 years. We're proud to have become a Certified Green Business in 2005, and have continued to increase our awareness and efforts since then. We're mission-driven, and preserving the environment is an important part of our school's Mission. We're beginning an effort to redesign our small side yard lunch area to enhance the garden and eating space for the children. Students and families are planning to build a bench using cob construction. The bench will be incorporated into the lunch area design. In addition, a parent has begun researching the cost-effectiveness of installing solar panels at the school. Get everyone involved! It has been a huge help to live in a community that offers so many resources for green living, and opportunities for training.